This dish takes its name from the Korean word for mixing rice but this variation mixes it with rice ramen instead. 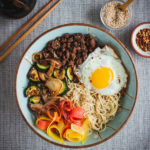 Sautéed vegetables, savory ground beef, and a fried egg are served over rice ramen, then mixed all together so the flavors and textures combine to create a gloriously tasty gluten free bibimbap ramen bowl! In a small bowl combine sweet red chili sauce, sesame oil, liquid aminos, ginger, and garlic. Add ramen cakes to a large pot of boiling water. When noodles begin to unfold (about 1 minute), seperate gently with a fork and reduce heat to a low boil. Continue to cook for 3 minutes or until the noodles are just soft. Strain and set aside. Heat a swish of olive oil in a large pan over medium-high heat. Add zucchini, mushrooms, and shallots. Cook until the veggies are tender and the zucchini is slightly browned, about 3-5 minutes. Season with salt and pepper. Remove from pan and set aside. Over medium-high heat, add another swish of olive oil in the same pan used to sauté the veggies. Add ground beef, breaking up meat into pieces. Cook until beef is no longer pink, about 4-5 minutes. Pour bibimbap sauce on top of the ground beef and continue to cook the beef for another 1-2 minutes. Then remove from heat. Divide ramen between bowls. Arrange beef, fried egg, veggies, including ribboned carrots, on top of ramen. Then taking your chopsticks or fork, mix all together so the flavors and textures combine to create a gloriously tasty gluten free bibimbap ramen bowl! Optional: Garnish with toasted sesame seeds, crushed red pepper, and top with sriracha. Everyone has their favorite way of frying an egg. My fried egg method is the same as this very detailed guide on how to fry an egg from Cookie + Kate so check it out if you need some pointers!